After being in this business for over 20 years, I’ve seen it all. Nothing from the past can compare to the Artificial Intelligence (AI) ingenuity our tech engineers have been incorporating into our campaigns recently. Besides saving time and money, this sophisticated tool has increased traffic and leads tenfold, particularly with our insurance and healthcare clients who thrive on solid, reliable leads. AI lead generation streamlines marketing campaigns because it acknowledges and uses key factors to identify ideal prospects. In the past, marketers had to rely on general demographic sorts such as income and age range. Now campaigns are being sorted by both demographic and psychographic keys, such as interests, geography, and purchasing habits. The AI component continues to fine tune its knowledge within each lead. If it seems like a stretch to those who think AI is nothing more than robotics and artificial assistants, like Siri (Apple) and Alexa (Amazon), the following statistics will surely expand your perspective. Getting leads is one thing, keeping them interested is yet another. When you realize that most prospects notice products and services several times before they purchase, using AI for continued engagement is the most cost-effective. Before most consumers make a decision, they need to be approached with new offers and additional reasons to buy. AI nurturing provides a higher ROI than the cost of a sales staff that follows up via phone calls or personal visits. Few prospects answer calls or emails from unknown sales people and rarely, if ever, agree to see anyone without an appointment. 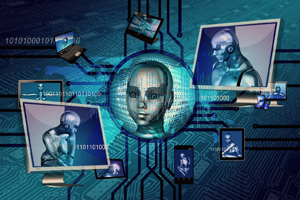 All the while, the AI leads have been sorted and those prospects who want to make an immediate connection are quickly identified. The remaining leads are organized into the sales funnel until they are ready to purchase. By the time a sales person makes contact, our AI lead generation system has already reached out and contacted more leads. After multiple leads are collected, they are sorted and prioritized which eliminates time spent on low-interest prospects. In the near future, you can expect our AI lead generation system to predict prospects’ behaviors and more stringently sort potential buyers from those who are simply window shopping.